This picture, given to me by Frank Grocutt, shows the rose garden that used to be in Chinbrook Meadows. Frank used to work as a groundsman and often worked in the greenhouses which can be seen just behind the pergola. The houses of Meadow Lane now stand where the greenhouses were and the rose garden and pond, which had become run down in the 1980s, are gone, removed when the Quaggy was naturalised in 2002. 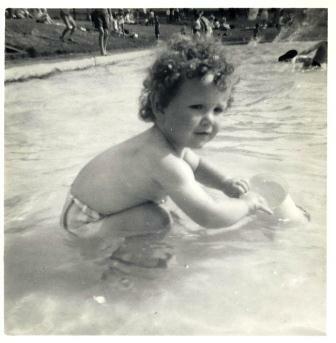 More memories from 1960s John Elliott was prompted by the earlier paddling pool photos to send the following to share. 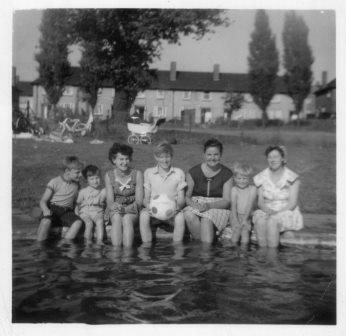 Left – right: Mark Barnes, David Dean, Joyce Dean, Simon Barnes, Rita Barnes, ?, ? Joyce was really involved in running children’s activities in 1970s, 5-a-side football, playgroups etc. This little group, who seem to be dressed up in their Sunday best, include Hazel and David Dean on the right. A short video made by the Environment Agency in 2006 shows the river after it was naturalised and hears from locals with their thoughts about it. 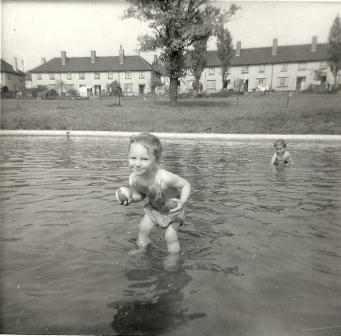 Memories added February 2013 – The paddling pool These photos, taken of Simon and Mark Barnes in 1961, may remind others of happy days spent at the paddling pool. Memories added February 2012 – Ray Hewitt lived in Mayeswood Road for over 25 years and remembers when the park was first opened. The farm land had been bought by the council to provide a recreational park for families living on the newly built housing estate and was a popular place for football and cricket. 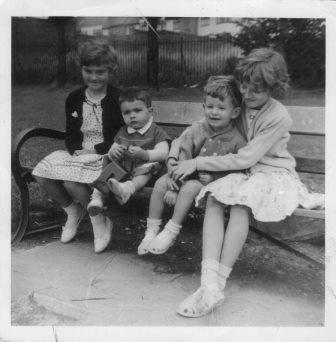 He recalls how, on still summers’ evenings he would hear the voices of fifty to sixty people chatting together, walking across the park on their way home from work having got off the train at Grove Park station. Ray, I don’t go back quite that far, but I do remember how popular the park was in the late ’60s and ’70s. When we’d won the World Cup there were usually so many matches or kick-abouts going on that you couldn’t walk straight through the park. In the seventies I think there were 3 divisions in the parks 5-a-sides!.The ‘hut’ was always very busy with activities. I The pavilion at the Grove Park side of the park was very useful for sweets and crisps. Parks in general seemed to have declined in popularity since those days, but the pics on the web-site seems to show that that trend is being reversed. There’s nothing better than getting outside and involved in sport or activities for people of all ages. My Ban and Grandad used to live at 182 Mayes wood road in the fifties and sixties. I grew up on the Chinbrook estate, my parents lived in the same house for 34 years. I went to Marvels Lane school and have many memories of playing in the quaggy with my friends ( linda Flower, Sylvia Etter, Dawn Liddle, Pamela Strong) I loved the rose garden and pond, it was my favorite part of the park. Seems like yesterday even though I’m 50 now. Wonder where everyone moved to, I live in Ramsgate by the coast but miss my roots every day. Grab the chance – it’s FREE!